Even before rising to international attention with Jurassic 5, Cut Chemist was known as one of best DJs in the game. Whether it’s his solo releases on his own A Stable Sound imprint or over-the-top live performances with DJ Shadow such as Brainfreeze, Cut has always provided his audience with a musical experience that’s fascinating, challenging and full on dope. Presented here is his latest, ultra-limited vinyl offering – Funk Off Megamix. The debossed razor blade on the cover is a call out to the "cut n paste" fashion of all of his mixes like The Litmus Test and Sound Of The Police. 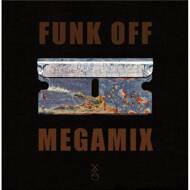 Funk Off Megamix explores the world of early 80s synth and drum machines primarily using material from his compilation "Cut Chemist presents Funk Off." Cut redefines this gritty dark post punk sound culled from original cassettes into a hip hop club dance floor ready mix equally enjoyable when spun on your own turntable.